is a title I sometimes give my hairshirt. 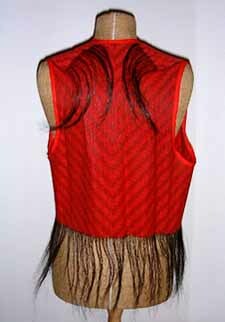 The hairshirt itself came about after I'd been giving a number of workshops on horsehair weaving, always getting the question "Where is your hairshirt, then?" 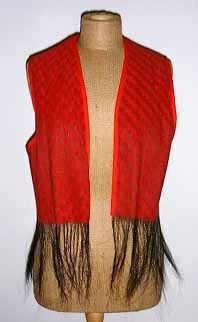 I wanted the fabric to be similar on both sides, but also to give the horsehair emphasis. This to me always spell "dräll", which word I have never been able to translate to the full. (In this case it means turned twill.) For some forgotten reason I decided the base structure should be a 2/1 twill, and I thought it would have a little more interest if threaded in points. Whith horsehair for weft the warp sett has to be more open than whith yarn for weft, as the horsehair can break. 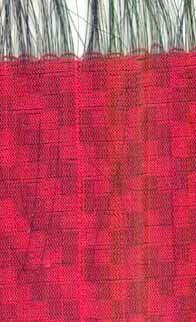 It has to be beaten hard, or the warp will shift along the fibers. This means one usually has at least twice the number of wefts than of warps. 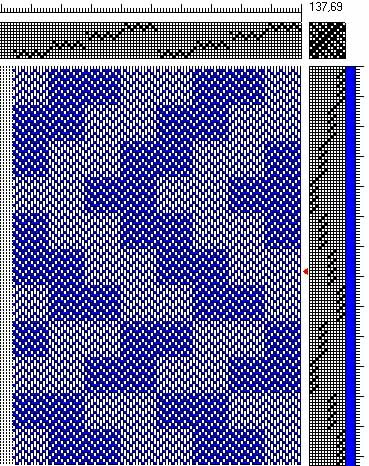 This, again, means the points in the threading get very compressed, and should I do it again, I would do it with 3/1 straight twill as the basic structure. My way of handling the selvedges can be seen: once every cm or so, I take a hair around the last end and back into the shed for maybe two cms. I let a bit of the hair hang out as an "inwards fringe". I can also be seen that one weft (=one fiber) has slipped out and got lost. The pattern break is directly under the armhole, so the width of the fabric at this point is ca 15 cms.